Koan (ko-wan) n. 1 Literally, "public document"; a topic or riddle issued to those training in the Rinzai Zen school of Buddhism to contemplate while meditating in yogic postures. 2 Pseudo-spiritual Vancouver musician, player of jangly, Nick Drake-esque guitar, possessed of an engaging voice with a tendency to write irrepressibly sappy lyrics. What, that doesn't say it all? Alright. 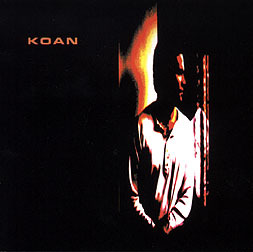 Koan, his philosophies and his curious little disc come at you from a 4-track and 8-track machine somewhere in Burnaby. The album has a pretty, dreamy sound (with "Sleepless" and "I'd Believe" are two of the best songs Dromedary has to offer), and the one thing that saves the CD from being an Ipecac substitute is a 50's sort of teen-idol crooner vibe. If you get the chance, go see him perform. Oh, and maybe you could drop me a line to let me know where he'll be playing? I'm intrigued.